As you'll see, the recipe isn't difficult, but it is time consuming and you shouldn't multitask while making marshmallows, the recipe needs you're constant attention. I'd give yourself an hour to make them and just be sure you have a candy thermometer before you begin. There's a lot of whisking, waiting, mixing...but trust me, it's worth it. A helping hand is a good idea. In this recipe, the sugar mixture needs to reach 260 degrees, which takes longer than you think- at least 15 minutes. Since we doubled the recipe, during the mixing, the marshmallows rose to the tippy top of the bowl and I was worried we'd be in trouble. But my mom didn't flinch, she knew it'd be fine. How do moms know these things? 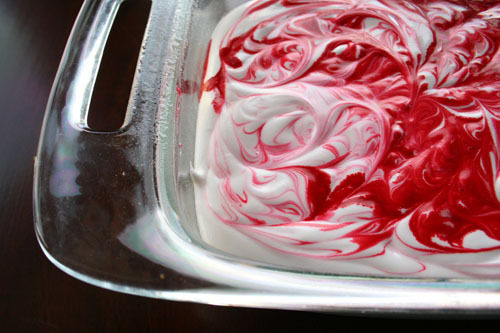 After you add the red food coloring, (or whichever color you like) just take a toothpick and mix around. My tip would be to add a few drops at a time as I got over eager and put in too much coloring at once, and then, you know how it goes, you can't take it back. So start off with just a few drops and build from there.